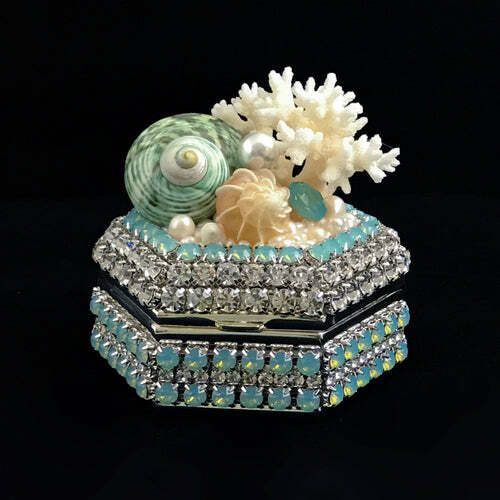 An elegant way to keep those special little mementos. 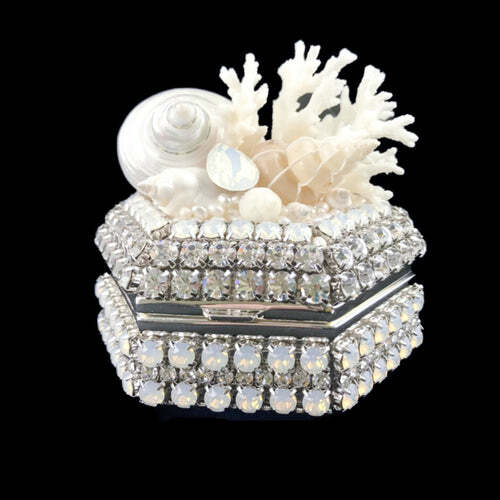 Place them in this luxury keepsake box with glittering Swarovski © crystals and freshwater pearls. You'll definitely love the beach ornaments. 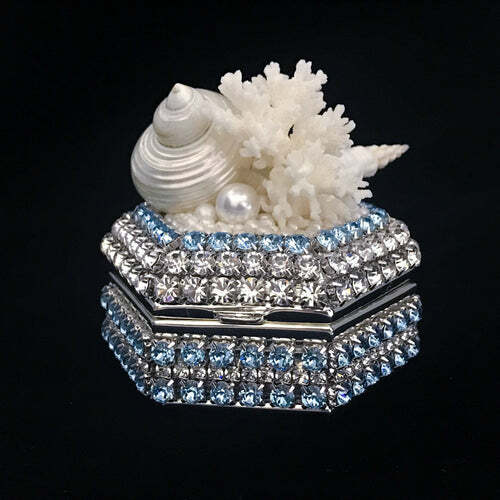 The perfect place for her treasured mementos and jewelry. “As you travel down life’s winding road, you start to accumulate a number of things; your tassel from graduation, notes from loved ones, an engagement ring. These mementos are the things that make up your life. When Jim and I got engaged, many moons ago, I could scarcely believe how fast my life was changing. I was living in a new city, about to graduate from college, and then all of sudden this man came into my life and changed everything. He stood down on one knee on the rooftop of Tamp International Airport with my Grandmother’s engagement ring in hand. I wasn’t expecting it, Jim caught me completely by surprise and thirty plus years later he’s still surprising me. Since that day I’ve cherished that ring both as a memory of that moment and as a reminder of how far we’ve both come. That’s why when I thought I lost it, I was devastated! Then, all of sudden I saw a glimmer in one of the plants I’d just planted. I bent down and on closer examination, there was my engagement in the soil with my basil. It must have fallen in while I was planting. I sighed a very deep breath of relief. Now the only question was, should I tell Jim? I decided against it, for the moment at least.